Charlevoix’s Marie Eckstein never expected to be in the fashion business. The retired Dow Corning executive says black suits were pretty much standard issue during her tenure at the company. But today, her socially conscious business, Red Dirt Road, revolves around unique, handmade scarves, shawls and handbags—and the Cambodian women entrepreneurs who make them. And the enterprise is making a big difference in a village half a world away. Give us the backstory on how Red Dirt Road got started. Well, this all began when I visited a village in Cambodia in 2011. During my visit I met this young woman named Saly. She and the four other women she was working with had all worked together in the garment industry and were now trying to start their own business. They sewed beautiful clothes, but when I met her, she hadn’t been able to sell a single thing. But there are certain people that stand out as being very special, determined, passionate, tenacious. That was Saly. She just wanted it so bad you could feel it. And so I just felt compelled to help her try to turn this business into something that could support her and the other women. Well, for the first year, I imported traditional Cambodian-style things. But the market interest was tepid to say the least. All my friends bought them and then they would hide from me and not return my phone calls! But the women had the skills. They could sew these very ornate garments. So I thought, Let’s see if we can have them make products that are unique, but would appeal to Western women. We’d pay them to manufacture the items, we’d sell them in the United States, and then all the profits would go back to Saly and the other women. It sounds like you’re having a lot of success. The impact of the businesses on the women there is hard to describe. The smiles on their faces and the gratitude is one thing. But I think what’s amazing is these women have so much confidence now. Here they are supporting their families with their own business in a village that really has no other businesses. They really hold their heads high. Last year, when we gave out the bonuses, we went around the room and asked each woman what she was going to do with her bonus. Almost everyone said they were going to save it for school for their children. The only one that didn’t was Saly—she’s not married. She was going to buy an iPhone so she could reach us back in Michigan! She can stand in a certain spot in her rice field and get enough service to send us photos. And I’ll send her back a happy face. It’s amazing what can be communicated through the universal language of pictures and emojis. Check out Red Dirt Road’s line of scarves, shawls, and handbags—and find a retailer where you can purchase them in Northern Michigan— at red-dirt-road.org. 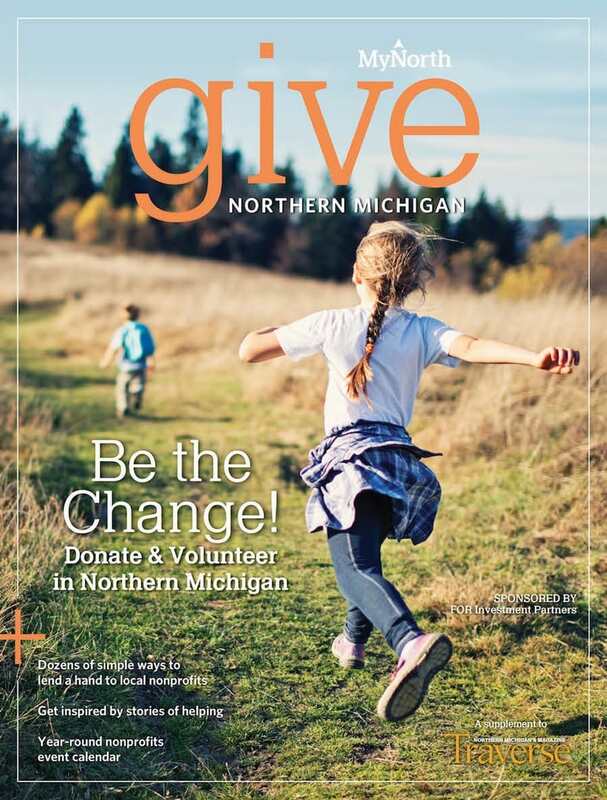 Click the cover to flip through the pages of GIVE!